Hi, I’m Megan Jackson, Lead Proposals Engineer, at GE Renewable Energy. I lead the assembly of GE’s technical proposals in response to wind farm tenders across Asia Pacific, including Australia, Japan, Korea, Taiwan, Indonesia and Vietnam. A large part of the role is to understand our clients’ problems and provide them the best solution. I need to use and more importantly, understand, IT every day. For preparing my technical proposals I use industry software packages – like any engineering package, they aren’t user friendly and require a good understanding of the software, process and engineering fundamentals to interpret the results. These software include GIS (geospatial information system) package GlobalMapper and Industry specific Windographer, WASP, WindPro and Openwind. All these programs require a large amount of memory and high quality graphics card, in order to compile in a reasonable time. These packages allow me to process lots of data, model a resource, determine the best fit product for a client and provide them with an annual energy yield prediction based on a level of uncertainty. Throughout the process I may also use 3rd party dashboards and portals, where I order modelling data and services. I’ll interpret and manipulate timeseries data (measurements recorded over time), which requires advanced Excel capability. Further, I transfer information internally or externally (submitting tenders) using online Cloud servers such as Box. I log tasks or post questions with colleagues from other regions (India, US, Europe) through an Intranet portal and chatter, it is extraordinarily useful for efficiently getting the support I need from experts on the other side of the world. Additionally, my role is the first stop gate for customer support, therefore requiring a systems engineering way of thinking. I need a broad understanding of the fundamentals of fluid dynamics of the wind, mechanical understanding of how the energy of the wind is converted into kinetic energy, then understanding of how kinetic energy is converted into electricity. However it also requires understanding of the communication of the control system and SCADA (IT) and how it sends signals to all the different components and how it reacts to the unpredictable nature of the wind. The communications is two way, with signals coming from the grid operator for example to command how much energy is allowed to be exported to the grid. This SCADA is logged within a server onsite and can be remote connected and controlled by the user (Owner or Manager (GE)). Technology is advancing along with the digital world. IT is opening many doors to so much data and more importantly converting the data into information. GE has 35,000 wind turbines installed. This means masses upon masses of information is available, however only until recently has advancements and attention to IT allowed for efficient processing of this data. What this has provided is a gateway into prognostics, diagnostics and efficiencies; for example, using trends from other wind farms we can now predict component failure before it happens, so we can be prepared and minimize downtime. We can monitor the loads that the turbine is being subjected and be able to push the turbine as hard as it can or notice if the turbine is not operating as efficiently as it should, resulting in more energy and more value to our clients. I am very proud of what I do. It is interesting, challenging and incredibly fast paced; which suits my “go hard or go home” mentality. However what drives me the most, is that I BELIVE in what I do, I am passionate about the environment, passionate about protecting it; knowing that I am doing my best to make a change drives me every day. Growing up, my parents were incredibly supportive; they encouraged me to dream big and they gave me the confidence to challenge myself. I was always curious about why and how things worked and how it could be made more efficient. I really enjoyed Physics and Mathematics; engineering was a really good fit for my inquisitive mind. The fact that engineering was a “man’s job” made it more of a challenge and made me more determined to pursue a career in STEM. Engineering is about problem solving; my career in STEM allows me to contribute to finding the solution to man-made climate change. At this time I am passionate about reducing our reliance on fossil fuels, however given everything is moving at a very fast pace, my career in STEM allows me to be front and center for the next innovation, the next big idea. Additionally I am passionate about being a part of a movement towards increasing diversity in the STEM workplace. Women are just a capable as their male counterparts, furthermore diversifying the STEM workplace would lead to enhanced creativity and increased quality of team problem-solving. We are taking a step in the right direction, however there is still a long way to go. My advice for other women starting their career in STEM, find a mentor and learn as much as you can from them, it will be your most valuable resource in the early stage of your career. They don’t have to be women, mine have been men – I have found men provide invaluable insight on how to be seen and heard in a man’s world. Also importantly – if you want to do something, just do it, don’t wait for somebody to hold your hand! 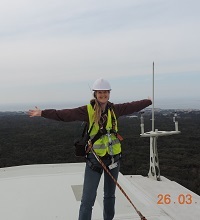 I was excited to be one of the finalists for the Engineers Australia “Women in Engineering Photo Competition 2015”. Women in Engineering Photo Competition 2015.